1. 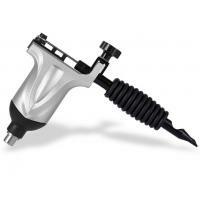 Newest version of rotary tattoo machine, frame is made of aircraft aluminium alloy, very exquisite and beautiful. 2. There is a Taiwan made motor installed in the machine gun, the power is 4.5watt, it has strong force, can drive the machine work smoothly, moreover, it has stable performance of work, can work long time without very hot. 3. 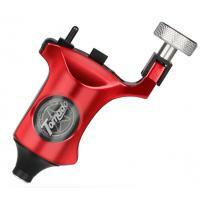 It has Small vibration and little noise when it is running, so that tattoo clients and artists can enjoy a quiet atmosphere , it is a fantastic thing in the parlor. 4. 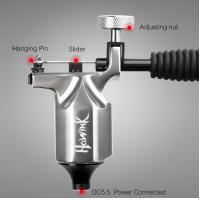 Machine has mature design of the functions, artists can adjust it to get the appropriate needle protrusion length as they want, for example from hard to super soft freely. 5. 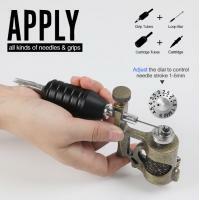 Don’t need extra rubber bands to fix the stainless steel needles, because the gun comes with needle bar stabilizing system, which is very cool. 6. The stitch speed range is 3000-15000 stitches per minute, work voltage available is from 7v to 14v, very convenient to control on the power supplies. 7. 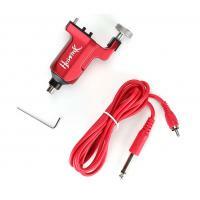 This gun has 2 connections, they are RCA jack and clip cord connection, well to satisfy different needs of artists. 8. 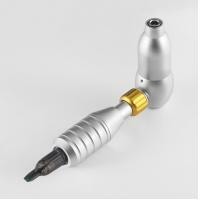 We can accept OEM orders if any customers have this demands. Door to door(by international express)--including DHL/UPS/FEDEX/EMS etc, generally 3-5 days arrived. This is the most commonly used way. Door to airport(by air)--normally 2-5 days arrived, but customer need to go to airport for customs clearance and pick up, suitable for large amount of cargo in a hurry to be delivered. Door to seaport(by boat)--about 10-50 days arrived, customer have to pick up goods and proceed customs clearance at destination harbor, suitable for unhurriedly bulky order to be shipped. 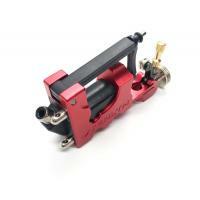 Send us inquiry for this tattoo machine gun model# M663 and quantity you want to purchase. We will send you competitive quotation based on your amount. After being confirmed by you, we will make proforma invoice for you. Choose one payment method from our options to finish payment. 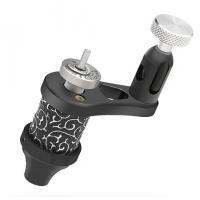 We will arrange shipping asap once your product is available in our stock. Give you tracking number or bill of lading to trace the goods. 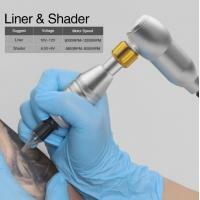 OH Tattoo Equipment co., Limted is one professional Tattoo&Makeup products Manufacturer and trader in China, we are focused on providing customers with high quality tattoo machines, permanent makeup machines, microblading pens, disposable tattoo needles, disposable tattoo cartridges, derma pens, derma rollers , tattoo grips, tattoo tips, tattoo power supply, tattoo pigments, tattoo aftercare cream, tattoo practice skins, tattoo transfer products and other tattoo accessories. We have rich experience of wholesale and retail in beauty healthcare industry, products are sold to market of Norther America, Europe, South America, Southeast Asia and Australia. We can accept purchasing orders from customers around the world, OEM is also available here, once meeting the requested purchasing quantity, we can print appointed logo on products or packaging box based on customers’ requirement. “Top quality and excellent service” is our business philosophy, we have mature desgin and production team to make sure every product meets international industry standard. OH Tattoo is always with customers together. In the future, we believe in that we will gain more and more positive support and reliance from customers around the globe. Do you wanna enjoy the lowest purchase cost? so easy! send us inquiry right now! Our sales will give you feedback within 12 hours. 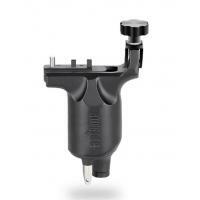 1)Send us inquiry including the product and quantity you want to purchase. 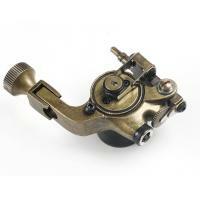 2)We will send you competitive quotation based on your quantity. 3)After all details are confirmed by you, we will make proforma invoice for you. 4)Choose one payment method from our options to finish payment. 5)We will arrange shipping asap(generally 2-7 days, depends on the specific order quantity). 6)Give you tracking number or bill of lading to trace the goods.